The machine builder Rovema GmbH with headquarters in Fernwald, Germany, makes use of cabinet-free servo drive technology from Bosch Rexroth for its EF2 end-of-line packaging machine. The solution has been designed for the packaging of sales units into standardized outer cardboard boxes. High performance, hygienic design, ergonomic handling and the extraordinarily slim design make the EF2 optimally suitable for the use in the food industry. From flow-wrapping machines through dosing and cartoning systems to end-of-line packaging machines: The company Rovema, which is based near Frankfurt am Main, Germany, has specialized in providing efficient solutions for a great diversity of packaging tasks. The new EF2 series has been designed for the packaging of food product units in so-called American cases. The use of Bosch Rexroth’s cabinet-free servo technology helps to significantly reduce the wiring eff ort and the space requirements of the machine. The controls of the EF2 series have been designed as user-friendly as possible: The mechanical system is easily accessible and enables the quick retooling from one product to the next. All components can be cleaned easily – ideal conditions for the hygienic packaging of food products. Powerful, compact, and ergonomic end-of-line packaging machine, which does not require a large control cabinet. Decentralized and cabinet-free servo drive technology connected via a single hybrid power supply and communication line. Unconventional packaging formats? No problem! Rovema’s EF2 makes use of integrated units of synchronized servo motors and decentralized servo controllers. The 15 to 20 axes of the machine are equipped with IndraDrive Mi drives from Rexroth and are ready to process the most diverse packaging formats. Despite the large number of axes, the system requires only one hybrid cable for the supply of power and the activation via Sercos . 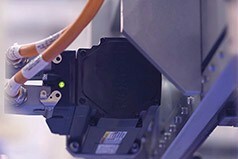 Directly integrated into the machine, a supply module with Rexroth control electronics serves to connect the decentralized IndraDrive Mi drives. Further benefits of the cabinet-free drive technology: significantly reduced commissioning efforts and material costs. PDF: "Slim machine design based on cabinet-free Rexroth servo technology"